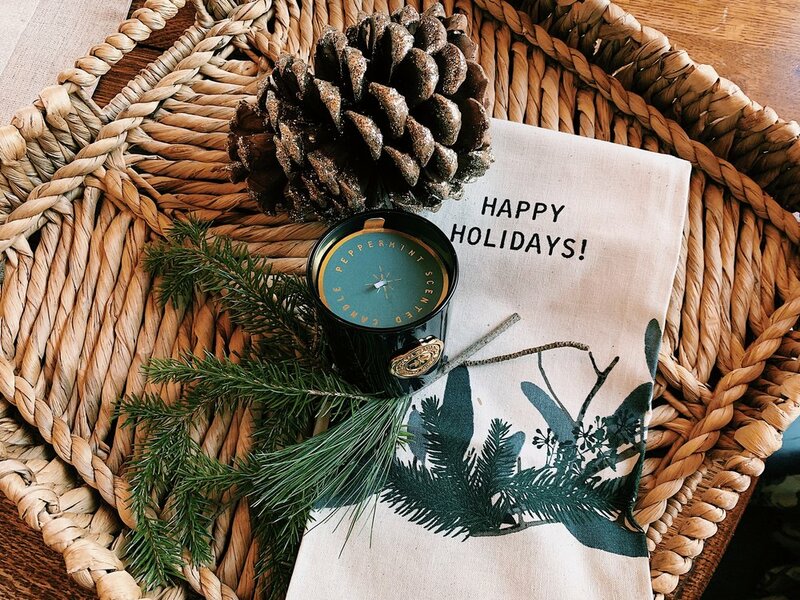 Festive, affordable candles & holiday tea towels from H&M home make a great hostess or teacher gift. It’s officially the last week of school before break and 8 more sleeps until Christmas day! With this in mind, I thought I would share some of my favorite go to’s for teacher, hostess & friends holiday gifts. Homemade sweet treats & chocolates for gifting. 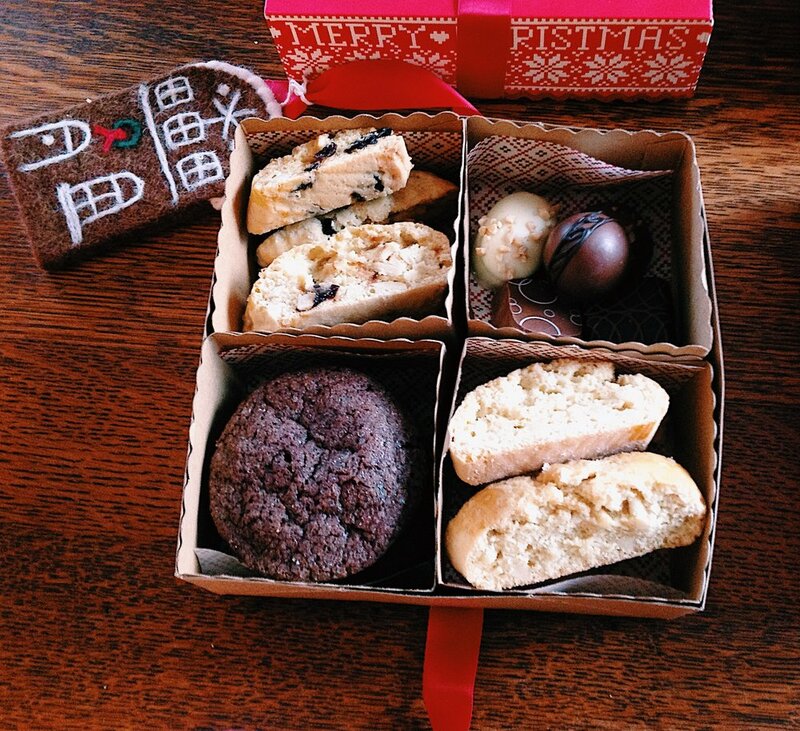 Cherry walnut biscotti, almond biscotti, truffles, and dark chocolate cookies, tied with a ribbon and topped with an ornament. I’ve written a bit about our little college town in Michigan, filled with friends and tradition. 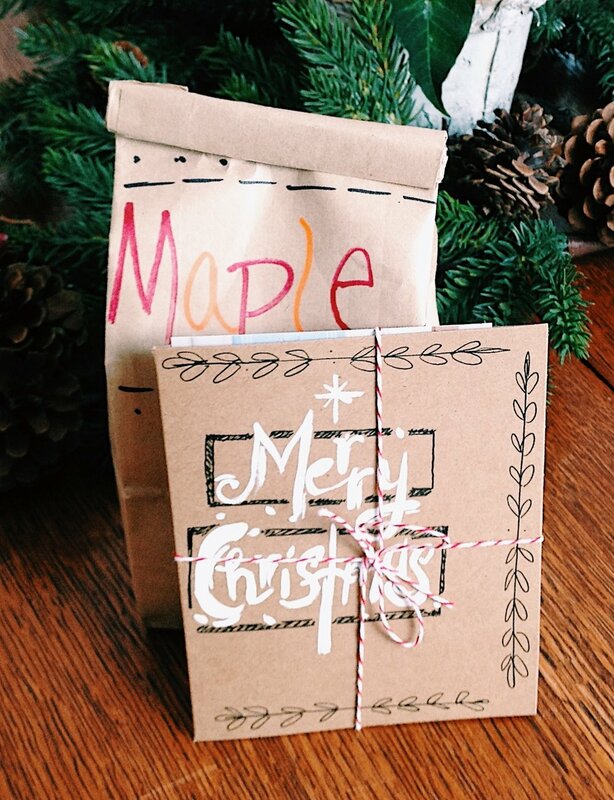 One of my favorites I learned when we moved here was gifting handmade treats among friends. These are not expensive gifts, but instead thoughtfully hand-crafted gifts from each of our homes. I recognize that the holidays are busy. Full to capacity and beyond. I feel this acutely. Heck, I work for a Christmas tree company-- this is my go season! But once again, I’ve re-learned the beauty of creating room in my December schedule to bake, create & gift. These gifts are not hugely expensive, but instead require slowing down and giving the gift of time and thoughtfulness. In many ways, today’s most precious commodity. My friend, Joanna, often roasts rosemary-herbed candied nuts and includes specialty chocolates. Jaminda changes it up each year—we’ve had homemade cinnamon infused simple syrup, raw jarred honey from a local bee grower, chai tea packs, etc…, Joni often assembles soup mixes in a sweet mason jar. For the Lutz family, my husband, Brock, roasts coffee and I love to bake old school Italian cookies (note some of main website photos). Coffee and handmade cards. This particular card & coffee was gifted to us, but Brock roasts coffee each year for friends and family. This is a tricky one… My aunt taught for 35 years. And I remember each December going through the large box of Christmas gifts that students showered her with each Christmas. I also remember that one can only fill cabinets with so many #1 Teacher mugs. So needless to say, my initial go to is gift cards. But interestingly, my kids like to gift actual gifts. They were embarrassed by my Amazon gift cards last year. “Mom, why can’t we give chocolates or a real gift? Gift cards are boring!” Ha! They haven’t had to make space for the billionth mug. ; ) But they are on to something—it’s infinitely more special to open up a box with a surprise treasure inside than a generic gift card. This year, I decided to combine the best of both worlds, a small gift along with a gift card. When it comes to gifts, I like to include things that I use up each year or need to be updated/replaced. Some of my favorites include, a quality candle, holiday towels & hand soap. My favorites are: Mrs. Meyers, Michel Design Works (found in specialty stores), Trader Joe’s White Pine hand soap (found in store), Williams Sonoma Hand soaps. I like nice hand soaps as a gift, a small luxury that I balk at buying it for myself, but always appreciate as a gift. A few of my favorite candles for friend and hostess gifts… Gilt Pomonder Hinoki by Voluspa. You can find them at Anthropologie. They are definitely a little spendy, so I like to wait for 30% off sales and stock up. Little splurges make great gifts! The Capri blue found at Anthro is another favorite. I’ve gifted a few of these this year, and was delighted when a friend brought me one during our homecoming festivities. Love this candle! For something a little more affordable, I am enjoying the home shop from H&M. Over black Friday I purchased hand towels and small holiday candles. We will gift those along with $10 coffee gift cards to teachers this year. Last year, my husband bought thermal coffee mugs and gift cards for aides and teachers who stand outside helping load and unload cars in the Michigan cold each day. Another fun practical combo. A few useful stocking stuffers. I know this is sacrilege to some people, but I love gifts that I can use around the house, and these items are top on my stocking stuffer list! I like to fill stockings with some of my favorite things…a little Oprah inspired! : ) And weirdly, or not, I like gifting practical household items that I love - including my favorite kitchen cloths from Trader Joe’s, the window & Enviro cloth from Norwex (ps…I have no affiliation with Norwex, I was introduced to these a few years ago and simply like them). The Window cloth is amazing. Not sure how it works with just water, but it does. Finally, scouring pads from Amway. My Aunt Deb gifts these to the women in our family each year, and after nearly 20 years, they have become household favorites and kitchen must haves! So that’s my favorite gift round up for 2018. I would love to hear some of your favorite affordable gift ideas as well. Leave them in the comments below!